Anarita Chorio is our holiday home away from home. Welcome to this presentation that showcases our town house, a fantastic example of luxury holiday rentals. The following pages are dedicated to our stunning property in Anarita, a beautiful peaceful village set in glorious countryside within the Paphos region of Cyprus. Cyprus is an island that has just about everything - great beaches, striking mountain ranges, bustling holiday towns and warm hospitality - and the area around Anarita now boasts some of the finest golf courses in the Mediterranean region. My Cypriot wife, Androulla and I both live in the UK with our two adult children and have been coming to Cyprus for over 25 years where we have many family & friends. Year purchased: 2011. After nearly 4 years of waiting we have finally been given the keys to our brand new property based in the beautiful and traditional village of Anarita near Paphos, Cyprus. It really has been a long wait and we are delighted to present our property to you where hopefully you may be tempted by what’s on offer for a well deserved break in the sun. I hope you agree we have furnished our property to a high specification and our aim is to give you a 5* experience in a peaceful and traditional setting without having to pay 5* prices being charged at nearby large hotel chains. After numerous visits to Cyprus to find the perfect location for our holiday home we discovered this idyllic and highly sought after gem of a village, Anarita. 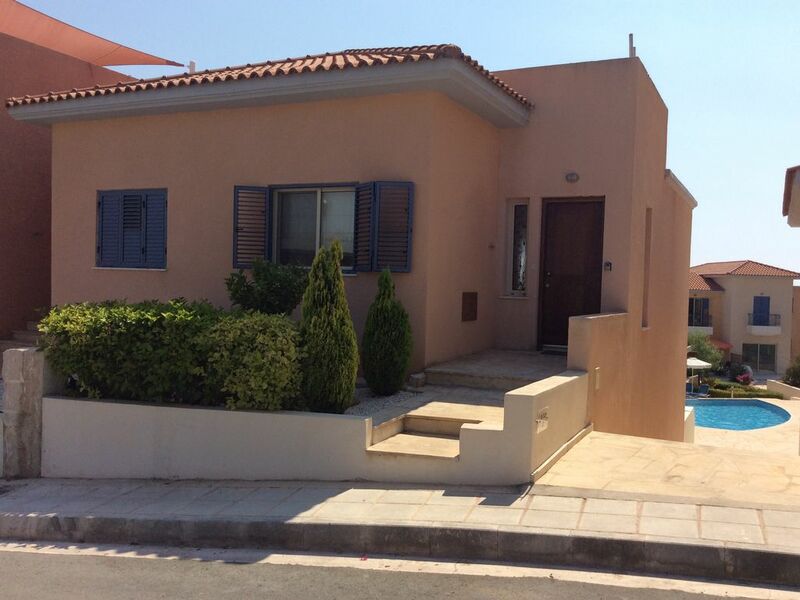 Being only 8 minutes from Paphos Airport and 15 minutes to Paphos centre it seemed the perfect location to buy. This area of Paphos has also generated a great deal of interest as a holiday destination due to being only minutes away and between three of the top golf resorts in Europe, Aphrodite Hills, Secret Valley & Elea Golf Club. The views and surrounding scenery at Anarita are stunning and for anyone that likes to walk and explore this will be a haven for you. Anarita is the perfect location for those guests seeking a peaceful and quiet location but within a short drive from all the nightlife that Paphos has to offer. Limassol is also only a 30 minute drive away where the restaurants, shops and nightlife are now some of the best in Europe. Anarita Chorio is built in an unspoilt Cypriot village and has every facility you will need including a a selection of excellent restaurants & tavernas, small supermarket, bars and of course the obligatory church. Anarita has benefited unlike other areas of not being over developed and the whole development has an exclusive gated feel about it. Our property has been built to a unique style that is spacious but has pockets of privacy for those guests who wish to spend time alone. We have furnished and designed our home to a very high specification for those guests that like a little bit of 5 star luxury whilst on holiday. Fully tiled en-suite bathroom to master bedroom with wc, shower, basin and vanity fixtures & fittings. Private bathroom to guest bedroom with wc, bath/shower, basin and vanity fixtures & fittings. The house benefits from a water high pressure system. Indoor (White) towels and outdoor (Turquoise) pool towels provided. Open plan L-shaped lounge/dining area with 42" TV/Satellite, DVD, iPod docking station, large L-shaped contemporary leather sofa, luxury interior designed soft furnishings an accessories. Round dining table with 6 dining chairs. Air con and ceiling fan. Fully equipped granite worktop modern kitchen with ceramic hob, conventional oven, fridge/freezer, dishwasher, microwave oven, toaster, kettle, Cappucino machine & concealed lighting. All utensils, china & glassware of the higest M&S quality. Wow.....where do I begin! Over the past ten years Cyprus has taken a massive financial step and opportunity to put itself on the world international golf map. With already two world class golf courses and another five international courses planned over the next ten years accompanied with perfect all year round weather in which to play golf, there has never been a better time to visit Cyprus to indulge your passion. Anarita perfectly positioned between two of the best renowned international golf courses in Europe, Aphrodite Hills and the brand new Nick Faldo designed, Elea Golf Club both no more then 10 minutes drive by car. Also nearby is the less challenging but beautifully scenic Secret Valley and Minthis Hills golf clubs. Notes on accommodation: Please note that our property is designated a strictly NO Smoking zone, kindly respect our wishes. All windows have locks and flyscreens and fitted shutters to both bedrooms. Electronic safe in master bedroom. 'X Box' Game Station with a selection of games WiFi Internet access (Optional cost) Tassimo Costa Coffee machine - Cappuccino, Latte & Americano Pods - (optional cost) Outside: Extensive beautiful landscaped gardens surrounded by olive and citrus groves. The maintenance management of Anarita Chorio is in the hands of the developer who are very proud of the development and pool areas and are cleaned daily by friendly staff. There is also a childrens play area and lovely local walks. Utility Room: Downstairs cloackroom features W.C.basin & washing machine. Iron and iron board, clothes horse & cleaning utensils. Cleaning / Towels / Linen / Maid service: Luxury white indoor and blue outdoor pool towels are provided. All luxury egyptian cotton bed linen included. For a bedding, laundry and full mid week house cleans this is arranged and paid for locally. Other: Patio doors lead onto private elevated south facing terrace & garden area with fitted pergoda overlooking beautiful split level pool. Outdoor dining furniture with two sunbeds and large sun parasol. Pool area has sun loungers, umbrellas, shower and W.C.
2nd visit to this wonderful property. Really enjoyed our holiday. Anarita is a great place to stay for peace & quiet but it’s also easily accessible to Paphos if you want entertainment and the beach. Stayed in this property for ten days a few weeks ago. Lovely modern house with fully equipped kitchen, comfortable beds and furnishings. Everything you require in a home from home including pool towels, UK internet television and good speed Wi-Fi. Lovely pool a few steps away from the patio which we often had to ourselves! Great location, close to motorway, local traditional villages, beaches, Paphos town, supermarket with good range of Cypriot and English produce and local attractions. We thoroughly enjoyed our first visit to Cyprus and would definitely stay here again. A beautifully presented property in a quiet location with quick access to the airport but with no aircraft noise. Extremely well equipped and immaculately clean. A wonderful base for a relaxing and peaceful holiday. This was our 5th visit to Paphos and the property was by far the best we'd ever stayed in. Complex was nice and villa was lovely. Very high quality and comfortable (especially the beds). Highly recommended and would definitely return. The house is gorgeous, finished to a high standard, everything you could possibly need. The setting is so peaceful in amongst farm land and the lovely village of Anarita. Pools are quiet and relaxing. In a great location for exploring Pafos and surrounding area. A perfect escape to chill and unwind. We will be back ! We stayed 18-25 March when the weather in Cyprus was mostly perfect. The last two days were badly affected by Sahara dust but that's not the fault of the property! Understandably the unheated pool was too cold to use, but we could see how lovely it would be in the summer. Anarita village is small, traditional and very handy for the airport ... with very little airplane noise. There's a local, large supermarket that stocks all the brands UK visitors are familiar with, including some Waitrose items. Gabriel's restaurant in nearby Kouklia serves great food in a traditional taverna location at very reasonable prices. The villa itself is very well equipped and having often stayed in rentals where you have to go out and buy all the basics on day one (and leave a lot behind when you depart) - kitchen roll, cling film, salt, pepper, hand wash, dishwasher tablets, etc - it was really nice to find everything we needed was there. The owners have furnished it in a modern style with all the finishing touches of a luxury hotel. Like many of the previous guests who wrote in the visitor's book, we would happily stay again. Thank you for a lovely week. For those guests seeking a slighly more active holiday, Anarita is a perfect base for walkers and hiking and being just a short 45 minute drive to the Troodos mountains where even in the hot summer months you can escape the burning heat to discover numerous nature trails and cooling waterfalls. Mandria, the nearest beach is secluded and unspoilt with no development at all, mainly pebbles, there are some sandy patches. Many small beach areas a few km away towards Aphrodite’s Rock. A little further is Pissouri (20 mins), where the fabulous curved bay offers watersports, sunbeds and tavernas. Coral Bay is a very popular blue flag beach about 30 minutes by car. There are two airports that serve Anarita, Paphos International Airport (8 minute drive away) and Larnaca International Airport (1 hour drive away). Many major airlines have a scheduled service as do large number of package tour operators. Airlines flying into Paphos International Airport. British Airways (Summer season only), Aegean Air, Cyprus Airways, EasyJet, Monarch, Thomas Cook Airlines, First Choice & Thomson. Car hire is highly recommended and is extremely easy to get around. Anarita is a pretty very friendly traditional village with a good number of local bars & tavernas all within a short stroll of our house. There is also a small mini market, post office and ATM machine for all your essentials including a beautiful church. For all your main shopping needs Paphos is a short drive away where you will obtain everything you will need for the whole of your stay. We also have included for your use, our in house "Holiday Experience Guide" where you will find all the information you need for local restaurants, trips and information about our house to make your stay as comfortable as we can. Booking Notes: A booking form will be sent on request by email or telephone call Payment to be made by cheque or bank transfer - 50% non-refundable deposit upon booking and final balance due 6 weeks prior to rental. We request a refundable deposit of £150 for any damage or breakages, to be paid a minimum of 1 week prior to rental. Changeover Day: Check-in: 4pm Departure: 10.00am Notes on prices: Discounts are offered for multiple weeks and long term rentals.